Last week we mentioned the drop in garden birds within the capital, this week we have an increase to report. 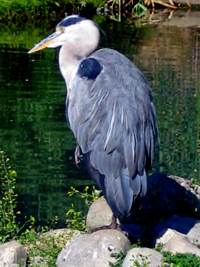 The grey heron is apparently thriving in London, with a record 32 pairs nesting in Battersea Park. Ecologist Valerie Selby elaborates on why this is a particularly good thing. They are a native species and a top predator in the food chain and eat a whole range of fish, frogs and ducklings which helps to regulate their numbers. Certainly beats Plan B, which was to get kids with catapults to do the regulating. It truly is an annus mirabilis for the bird. Over in the City, the much delayed Heron Tower is finally showing signs that it might get built, with secure funding now in place. The tower has nothing to do with the wingy, flappy kind of heron but, hey, it’s a link. Plenty of cranes in the City too. Sorry.